We, the dogs here at the Carson shelter, want to THANK YOU for supporting our shelter with donations of blankets and towels and toys and everything else you give us! 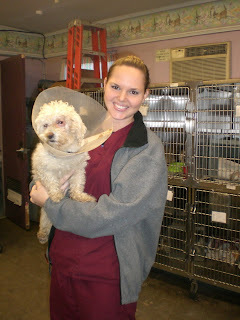 We thought you'd like to see a photo of Christy, one of our vet techs. She and Leslie and many other staff members work real hard taking care of us! And we'd like to remind you that Ginger really needs a home. She's a sweet girl who wags her whole body when she greets you. And Tricia (AKA Lulu) doesn't have a home yet either. This will be our final post for the year, because Susan will be needed elsewhere until after New Year's. If you can come down here to the shelter over Christmas vacation to visit us, that would be fantastic! Until next year, we are signing off!